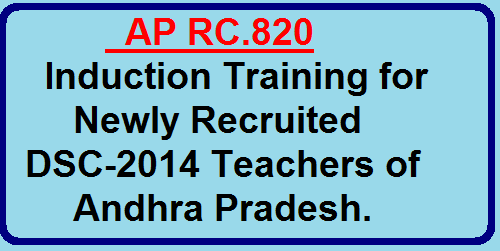 AP RC.820 Induction Training for Newly Recruited DSC-2014 Teachers of Andhra Pradesh. SCERT, AP, Hyderabad — Induction Training for Newly Recruited Teachers-Selection of State Resource Persons and district resource persons - Reg. 1. All the District Educational Officers in the State are informed that the Government is going to appoint new teachers through TET-TRT 2014. Further the Commissioner, Department of School Education has approved the note file and decided to provide induction training for the New Primary teachers and Language Pandits. 2. The main objective of induction training is to inculcate commitment and passion towards teaching profession. 3. In this connection all the District Educational Officers with support of Principals of DIETs identify well qualified, well experienced teachers to act as resource person. They may be SGT or SA with Primary school experience. The resource person should ignite such competency among newly recruited teachers. 4. Hence DEOs and Principal of DIETs requested to select required number of such kind of teachers to act as District Resource Persons and State Resource Persons. Number of teachers to be recruited in the districts is annexed. 5. All the DEOs are instructed to submit the selected list of resource persons to SCERT on are before 20-4-2016.